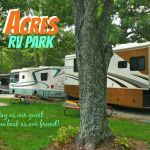 Ask fellow campers about "Pheasant Acres RV Park" and nearby attractions. Very helpful host. Bathroom clean, showers showing some wear. Small, quaint park. Sites not large, may have to unhook. We camped at Pheasant Acres RV Park in a Travel Trailer. This is a gem in St. James, Missouri ! I found this park on Google reviews & RV Park Reviews. There are about 25 sites, each with picnic table, fire pit. Had full hook ups, mostly back ins. There are trees everywhere, hiking trail right from the park. Trout fishing is great here, we were told, but we don't fish. Only about 5 miles from interstate, through an adorable town. The owner was awesome, she came out immediately & helped my husband back in ! Our stay for one night came to $27.00 and so worth it ! Wifi not great but we had our Verizon hot spot so no worries. TV was so so, but we didn't come to watch TV! We would definitely stay here again & would have extended our stay, but there is a chili cook off this weekend & they are booked. We camped at Pheasant Acres RV Park in a Travel Trailer. We didn't get in until almost 5 pm, so did not explore around. But there are many things to do around here. Onondaga Caves, local wineries, caverns, Trail of Tears, festivals etc. This campground is about 8 miles south of the freeway, situated behind the owner's home. It is small and well managed. The owner met us at the entrance and led us to our site. It was an easy back-in. Very quite and next to a county park with plenty of places to walk with your dog. I would highly recommend this park. I would suggest to the owner however, that she paint the basketball backboard mounting pole florescent orange and clearly mark it. Paying attention to the owner, who was leading us to our site, I barely missed hitting it! Absolutely no other complaints! We camped at Pheasant Acres RV Park in a Fifth Wheel. Watch out for the basketball pole!!! The owner is an absolute doll and the folks that are long term in the campground are some of the nicest folks we have come across. We were here for one night and it was absolutely perfect for us. The hook ups were fine. The owner is very accommodating. She has some very cute bunnies on site and the property is very cute. We would definitely stay here again. The sites are gravel and level. There are lots of large, beautiful trees, trimmed back so that they do not touch the campers. We camped at Pheasant Acres RV Park in a Fifth Wheel. If you are not experienced driving a big rig, go slow. The sites are not the easiest to navigate but defiantly doable and once you are docked, it is worth the effort. About 4 miles off the Interstate. Very quiet except for the sounds of the birds and tree frogs. Very nicely maintained and the owner was very personable, made you feel happy you came here. Water pressure was a little lower than average and the WiFi was about par for many campgrounds. Most sites were back-ins but were reasonably level and easy to negotiate. We camped at Pheasant Acres RV Park in a Travel Trailer. I'm happy to have had you as a guest at PARV, and I am chuckling at the frog and bird comment. I will have to speak to Mother Nature about her children being noisy. LOL And yes, we are on a well, not city water, so water pressure is not that of a fire hose by any means. Since this park is located at the beginning of the National Ozark Scenic Riverways, there are few and far between towers for WiFi coverage. The further south you go the less chance of Wifi availability. I moved here from St. Louis and indeed it did take me some time to get used to more minimal services available. Thinking that is the price we pay for being able to enjoy the beauty here in the Foothills of the Ozarks. Sure hoping that you will give us another try in the future, and perhaps enjoy the nearby Trail of Tears, travel on the Mother Road Route 66 or visit beautiful Dillard's mill and visit the nearby caves. Or perhaps go trout fishing at historical Maramec Spring Park. This area has so much to offer. Great little campground. You bring Hwy 8 to the camp so very easy to navigate and the road in the campground is good. The owner is fantastic, super friendly and knows all the local ins and outs and a great deal about Route 66, which is what brought us here. 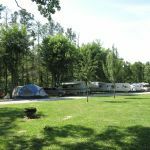 The campground is well maintained, a mix of seasonal and overnighters. It is very quiet with no road noise. The sites are gravel with some grass, very level and include a picnic table with a solar light on it, and a fire pit. Ours was a back in with full hook ups and 50 amp. We had to push our tow dolly off to the side and we had just enough room to park our car after backing our 37-foot RV in. There is plenty of shade which we like. Water pressure was good. WiFi was good, but didn't always work, our Verizon hotspot was strong. There are trails in the woods that take you to the Conservation Area next to the campground, great for hiking and walking the dog. Bathrooms and showers were clean, no laundry facilities. Route 66 and all it has to offer is close by. We stayed the last week of August 2016 and paid the weekly rate of $140/ $20.00 a night. We camped at Pheasant Acres RV Park in a Motorhome. When backing into the spaces watch out for the wires at the back of the site - they are low in some spots. 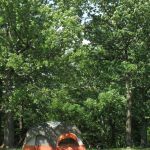 Nice private campground, easy access to I-44 near Meramec River. Peaceful setting, friendly owner, shade, electricity, water, sewer, Internet available, tv available. We camped at Pheasant Acres RV Park in a Tent Trailer. Meramec Caverns 30 minutes east, several wineries in the area, Steelville antique soda fountain in operation, best burger I ever ate in Potosi, Meramec River for fishing. Hi there! And let's not forget we're close to caves, Dillard's Mill, Trail of Tears, Route 66...and how did you miss dining at Sybill's. Now you have a reason to return and eat a heavenly dinner right in St. James. Thank you for reviewing PARV and hoping to get to visit with you again in the future. Happy camping travels to you. Pretty setting in the trees. A little far from I-44, and the spaces were a little tight for a long 5th wheel, 37'. No working Internet and satellite wouldn't pick up all my channels. Too many trees. A good, reasonable overnight stay. We camped at Pheasant Acres RV Park in a Fifth Wheel. A pretty and pleasant little campground, a bit of a drive off I-44. It was a bit tight for us, we have a 37' fiver with a HDT - 65' long overall. Lots of trees, could not get satellite signal and no OTA TV. Very friendly and helpful hostess. We would stay here again IF we were traveling in a smaller rig. We camped at Pheasant Acres RV Park in a Fifth Wheel. 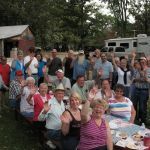 Are you affiliated with Pheasant Acres RV Park ?